Image credit: Rahr & Sons, Lakewood Brewing Co. 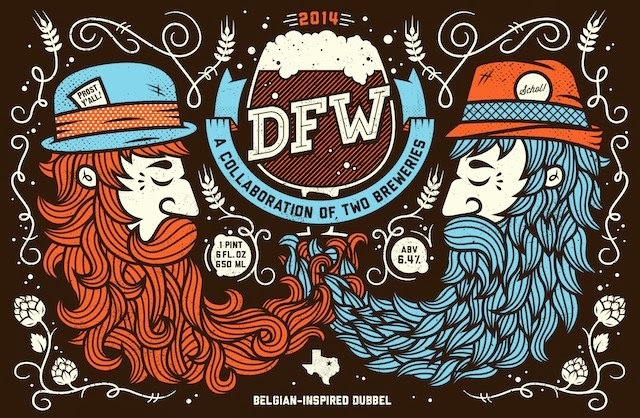 In historical terms, the beer called DFW represents something of a milestone for the North Texas craft beer industry. As to the reason why, the answer lies right in the center of the label. "A Collaboration of Two Breweries," it represents the first such partnership between production breweries, not only in the region, but also in the state. This joint effort between Rahr & Sons, the area's longest tenured production craft brewery, and the Lakewood Brewing Company, was released to coincide with North Texas Beer Week. "A natural fit," as Rahr & Sons founder Fritz Rahr called it, the coupling was borne during a time when Lakewood founder Wim Bens worked as an apprentice at Rahr prior to opening Lakewood in the summer of 2012. It's something that will continue as well, with the two breweries getting together each year to produce a new and different beer. Billed as a Belgian-inspired dubbel, Bens supplied recipe elements of Belgian yeast and candi sugar to go along with a blend of malts chosen by Rahr. The resulting beer certainly looks the part of the intended style, being dark amber with, to borrow a phrase from the BCJP, a distinctive "reddish depth of color." In terms of aroma, there's no mistaking the beer's malt-driven base. A grainy sweetness emanates upfront, backed by a layer of toasted malt and a hint of cocoa. Contributions from the yeast are present, though not overly intense, with esters being more raisin-like than anything else and phenols coming about in the form of a bit of background spice. It's a similar story in the taste, with a malty sweetness maintaining throughout. The beer finishes smooth, with little or no bitterness and a medium-full body seemingly lightened somewhat by the carbonation level. The latter being just bright enough to enhance drinkability while not intruding upon the flavor. As for how it all comes together, North Texas' first collaborative brew is mild in terms of both strength, coming in on the low end of the ABV scale for a typical dubbel*, and the overall richness of flavor. That said, there's a nice complexity to the beer, and it's about as easy-drinking a dubbel as you'll find. While it might not pack enough punch to satisfy a big-time beer geek, there's more than enough going on in this beer to make it a satisfying taste experience for anyone looking for a more tempered take on the style. * 6.4% ABV compared to a range of 6-7.6%.